Learn how to fill out and submit the Victoria’s Secret job application to stores in your area. Victoria’s Secret is an American retailer of lingerie, women’s wear, and related products. The company is the largest subsidiary of L-brands, and has more than 1,100 locations scattered throughout the U.S., Canada, and U.K. Step 1 – Go to the main careers page (link will open in a separate browser window/tab). Step 2 – Scroll down the page and select the type of job you want to search for (e.g. store, sales leadership, corporate). 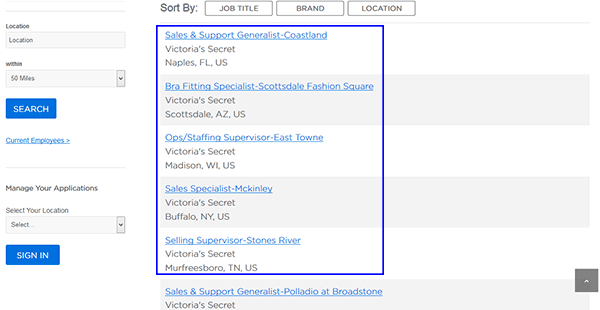 Step 3 – Select “Victoria’s Secret” from the drop-down list on the left side of the page and then click the “Search” button to view the results. 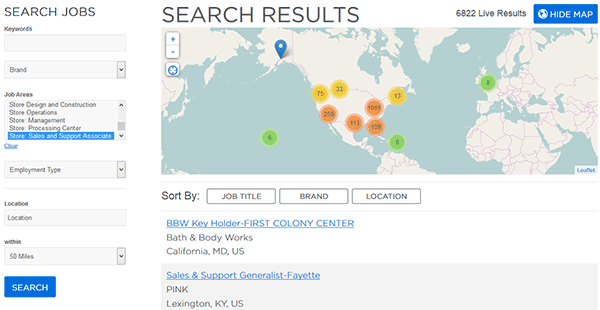 Step 4 – Sort the results by job title, brand, or location. Click the link of the job you want to apply for. Step 5 – Press the “Apply” button to go to the next step. 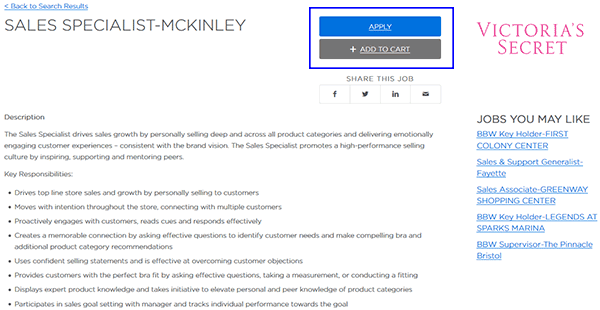 Note: You can click the “Add to Cart” button if you want to apply for more than one job. Step 6 – Create a new account by clicking the “New User” link (or sign in with your Yahoo account). Step 7 – Select a username/password, enter your email address, and the press the “Register” button. If you’re legally able to work in the U.S. Step 10 – Optional: Upload your resume.